Creating Art Quilts capturing New Zealand's beautiful animals and scenery has been my passion since moving to Northland 14 years ago. After finding it difficult to source certain types of fabrics I started customising my own fabrics with paint and fabric markers. The potential for this is unlimited. 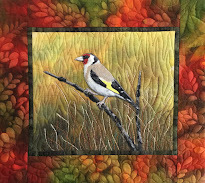 Free motion stitching is another passion of mine whether it be quilting or thread painting animals to enhance my quilts. I love sharing my techniques and have had the pleasure of teaching all around New Zealand.